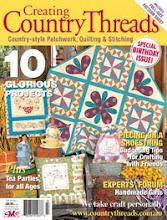 I thought I'd show you a sneak preview of a stitchery project I have designed, being featured in 'Australian Country Threads' magazine in September. Mmm....I wonder what could it be? Sandi, I love the colour and little bit I can see so far;)How exciting ;)Can not wait to see the full project in the glossy mag!!!! It looks intriguing. I can't wait till the postman delivers my copy. 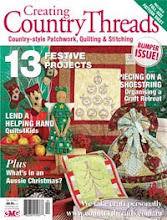 Congratulations coming in 'Australian Country Threads', with your work. Looks very neat whatever it is. I should add that Im looking forward to seeing the finished article, and well done to you to having it published! Congratulations Sandi - You must be so excited! The little sneak peak looks fabulous - can't wait to see more. Yes I wonder what it is!